Our boring world doesn’t have real Imperial Arms. It’s just too hard to get your hands on reliable Dangerous Beast parts, you know? Don’t worry: Sentai Filmworks has you covered (Tee Hee. Literally covered!) with officially licensed Akame ga Kill! merchandise. Think of them as Sentai-style Imperial Arms! 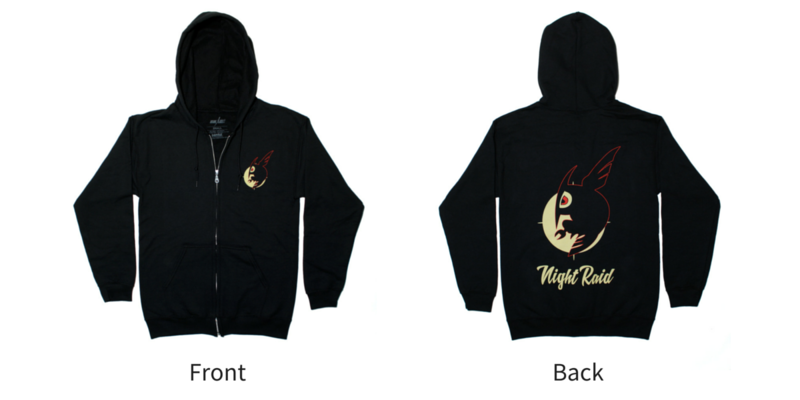 There’s no need to hide your affiliation with Night Raid in our world. In fact, we’re going to help you flaunt your Night Raid love with THREE tops, each emblazoned with the infamous Night Raid logo. 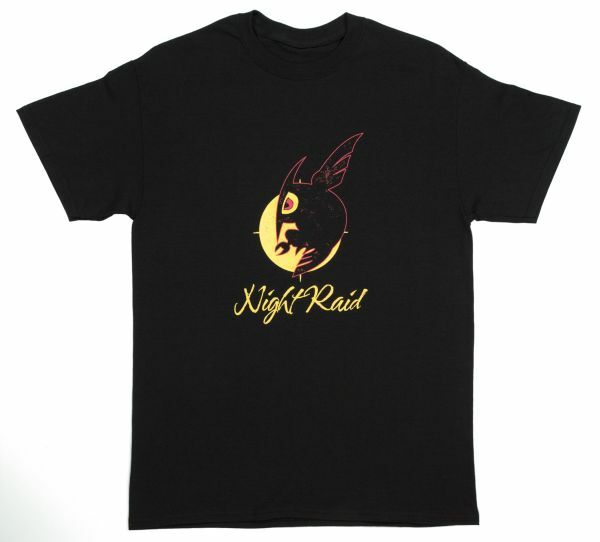 This vintage detailed Night Raid tee accentuates the battle-hardened lifestyle of a true warrior, making it the perfect item for any Akame ga Kill! fan. State your allegiance to the revolution… in style! This Akame ga Kill! 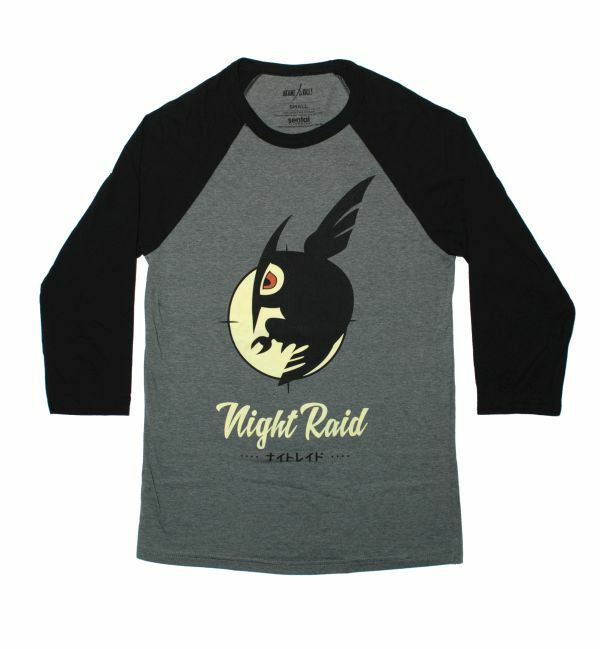 inspired black and gray cotton Raglan tee proudly sports the infamous Night Raid logo. Like the assassins of Akame ga Kill!, stand your guard against the chill of the empire (or winter in general) with this zip-up Night Raid hoodie! 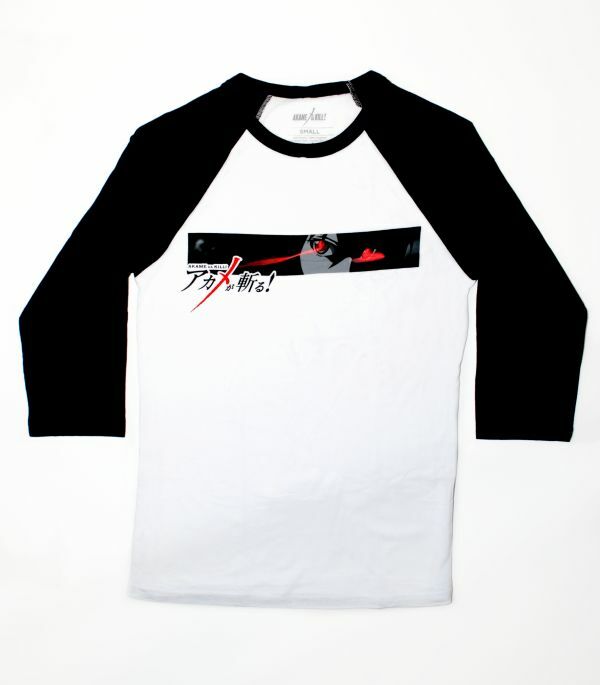 Buttons, tees, and a raglan, oh my! Take the cast with you wherever you go with merchandise featuring title character Akame. 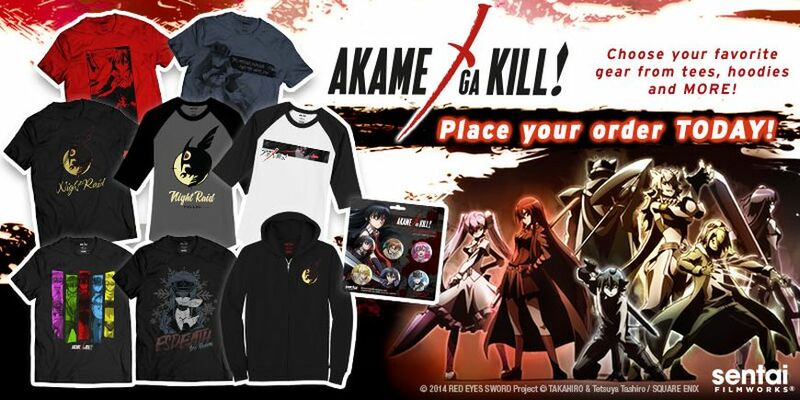 Flaunt your love of Akame ga Kill! With this button pack. These little accessories are perfect add ons to take into your next battle... err... everyday life. Akame's stare might intimidate the rest of your wardrobe but, don't worry, the only thing she will kill in your closet is your desire to wear anything else. When Akame rests her crimson eyes on the enemy, only death will follow. Fortunately, the only thing this shirt will be slaying is your need for another tee. Stride along with the cast of Akame ga Kill! in this colorful tribute to Mine, Tatsumi, Akame, Esdeath, and Leone. Trump Card: making its wearer look amazing. Sentai Filmworks knew we had to pay tribute to everyone’s favorite yandere waifu, so General Esdeath is here to represent the Jaegers on, not one, but TWO shirt designs. This collection just might be, forgive the pun, cooler than the others. 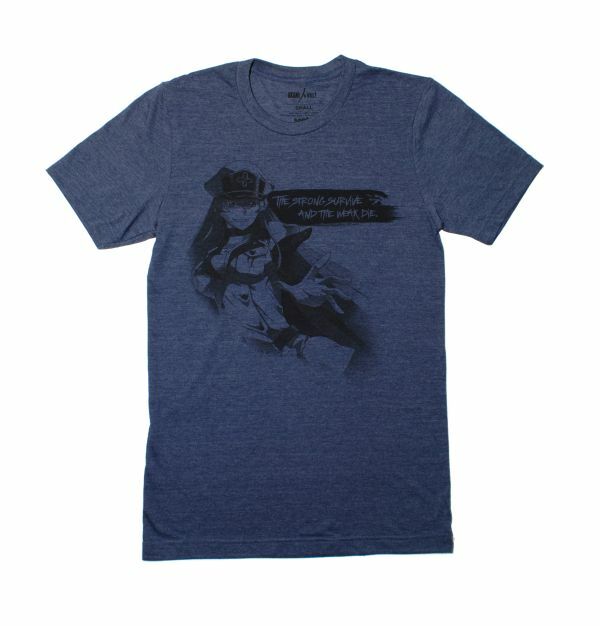 True to Esdeath's mantra, this tee is strong inside and out, but can cuddle you up with its soft embrace. Finally, an Akame ga Kill! tee shirt that lives up to her high standards! Esdeath is coming... home to her fans! Take the stylish ice queen of Akame ga Kill! with you wherever you go. For such a cold figure, it's amazing how comfortable this high quality tee feels. Show Off Your Imperial Arms! It’s one thing to have the Akame ga Kill! box set happily nestled in your collection, but your stash just isn’t complete until you’re able to take your favorite characters with you into the fray of real life! Find your favorites and more on Sentai’s Amazon Store. 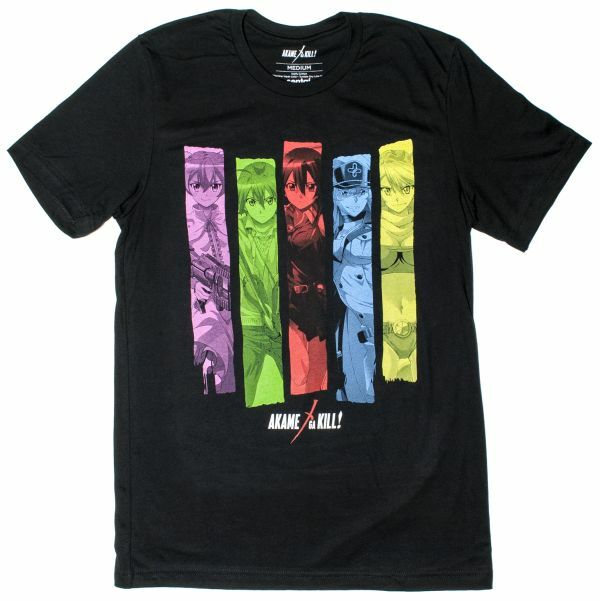 merchandise t-shirts akame ga kill!